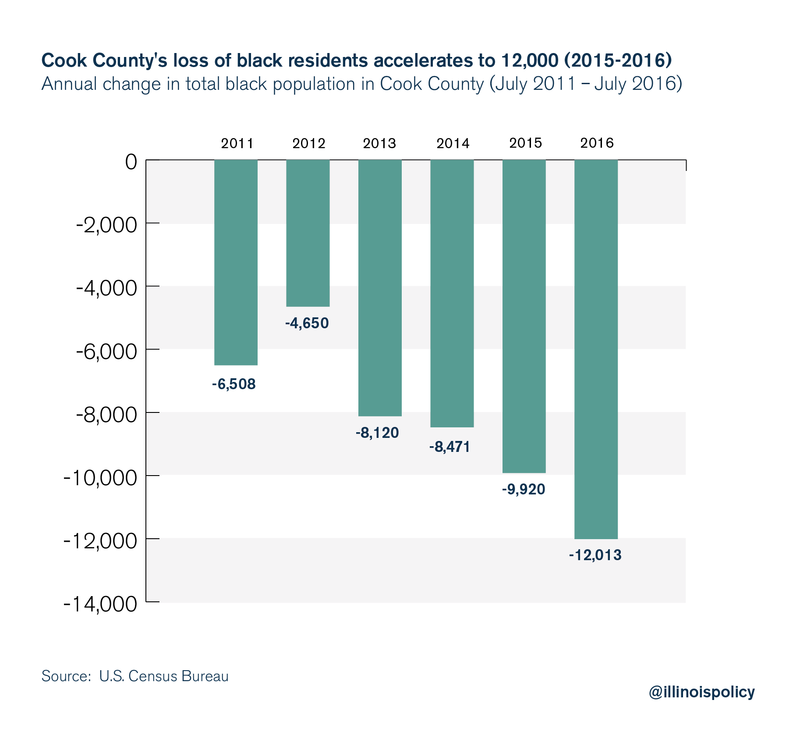 Cook County has lost nearly 50,000 black residents since the 2010 census, and the rate is accelerating. Cook County is home to two-thirds of all black residents in Illinois. And Cook County’s black population is shrinking because the county is losing more black residents than any other county in the nation. The total black population of Cook County fell by 12,013 people from July 2015 to July 2016, according to data released June 22 by the United States Census Bureau. Black flight from Cook County and from Illinois occurs against the backdrop of the nation’s highest black unemployment rate. One in 4 Cook County residents are black. However, more than half of Cook’s total population decline on the year (21,324 people) came from a loss of black population. 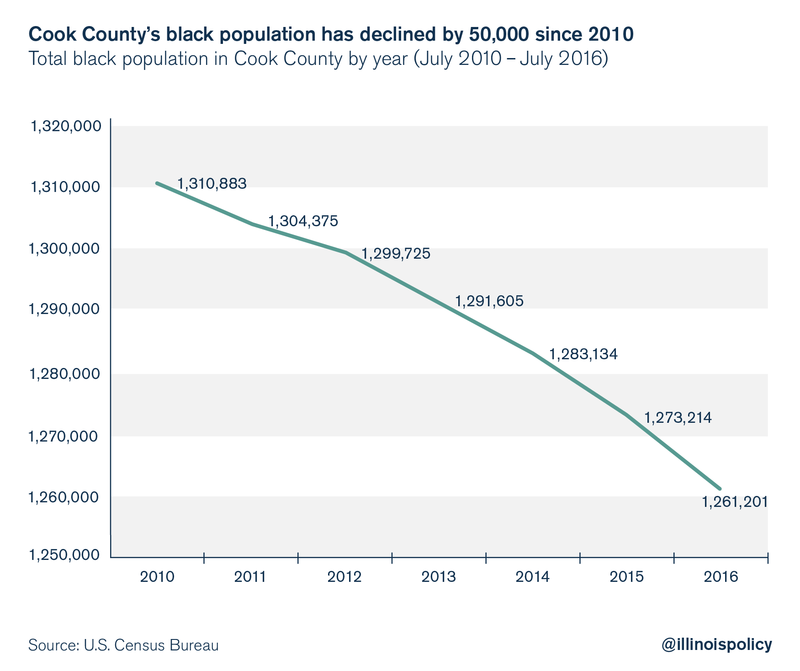 Cook County’s black population has been in long-term decline, dropping by 117,618 from the 2000 census to the 2010 census. And Cook has lost another 50,000 black residents since the 2010 census, with accelerating losses of black residents nearly every year. Cook’s black population is estimated to have fallen to 1,261,201 in July 2016 from 1,310,833 in July 2010. 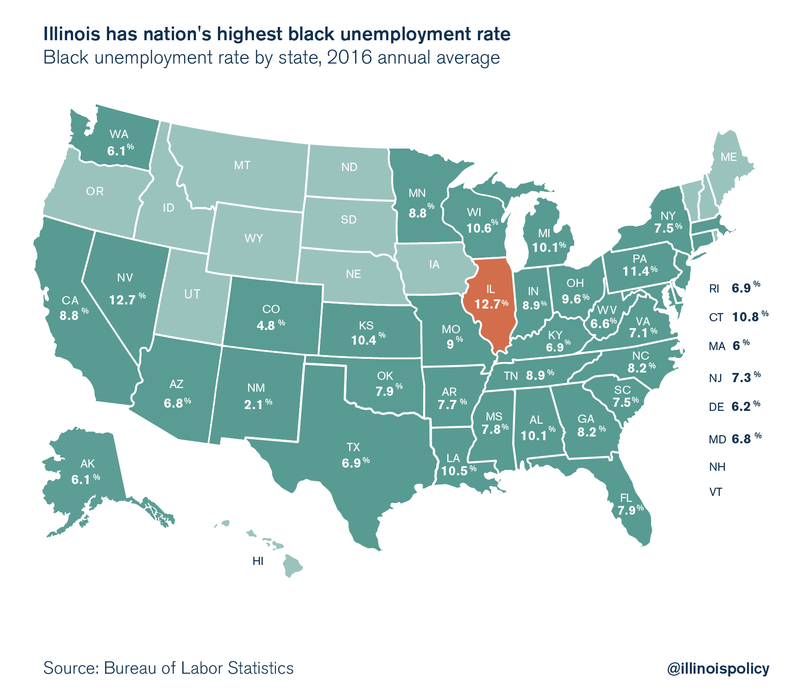 Illinois is home to the nation’s highest black unemployment rate, making a lack of jobs and high crime rates likely culprits in black flight. And according to the Rev. Corey Brooks, the pastor of a church on the South Side of Chicago, the two issues are related. “(Violence) is about economics. People can’t eat. People can’t sustain their families,” Brooks told the Chicago Tribune. Better job creation in economically depressed areas would help reduce the incentive for drug-related violence. But the nation’s highest black unemployment rate leaves too many young black men and women with few options to feed their families. The housing market in the predominantly black neighborhoods of Cook County is also in severe trouble. A reported 28 percent of all homes in southern Cook County are seriously underwater on their mortgages, meaning that homeowners owe significantly more on their mortgages than the homes are actually worth. Depopulation and crushing property taxes are destroying black homeownership and bleeding the equity out of homes in black neighborhoods. A recent investigation by the Chicago Tribune suggests that properties in many lower-income Cook County neighborhoods, many of which are predominantly black, are systematically overassessed by the Cook County’s assessor’s office, relative to properties in other parts of the county. If this is true, then the Cook County property tax system likely contributes to further black flight and deterioration of black home values. Illinois’ black community acutely needs what the rest of the state needs: property tax relief, better education opportunities and far more job creation. Property tax relief can only be achieved by dramatically reforming local spending drivers, such as by changing the rules for government union contracts, consolidating units of government and repealing cost drivers such as Illinois’ prevailing wage law. Black communities need better schools that spend resources in the classroom instead of on bureaucracies and pension debts. School choice would benefit black children by allowing their parents to opt out of failing schools and opt into schools that can provide better opportunities for college and professional success. There also needs to be more pathways to prosperity for students who do not go to college. Black young adults who graduate from failing high schools will likely not be helped by Cook County’s rising minimum wage requirements, given that many economists have found overwhelming evidence that high minimum wage rates keep low-skilled and minority workers out of starter jobs. Prevailing wage law repeal would also likely help with blue-collar job creation in black communities. The law has a history rooted in racial discrimination and still blocks many black workers from higher pay and good construction jobs. Black Illinoisans face other barriers to job opportunities in Illinois’ criminal justice system and occupational licensing regulations, too. Nearly 60 percent of Illinois’ prison population is black, meaning that barriers that make it harder for ex-offenders to obtain employment can be especially harmful for black residents. Cook County’s black flight isn’t entirely a result of policy failures, but that doesn’t mean political leaders should fail to act on items they can improve. Lawmakers in Springfield and in Cook County should focus on solutions to solve the nation’s highest black unemployment rate and reverse the nation’s worst black flight.